I dedicate this inaugural Jabavu Lecture to four men and their families. Here is who they are: Mr. Bhekindlela Mwelase, Mr. Xhengwana Mwelase, Mr. Mndeni Sikhakhane, and Mr. Ndoda Mngoma. You may not have heard of them until now. I too did not know a thing about them, until I unexpectedly came across Mr Khaya S Sithole’s inspired writing about them and their demise. In his account Mr. Sithole, an academic at the University of the Witwatersrand, combines academic research with the imaginative sensibility of literary art. 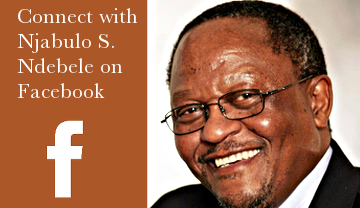 Sithole’s approach enables him to tell a story of our times. In that story we can discern on the large canvas of history, sweeping events that have affected millions of people in their various national contexts, such as in South Africa, and from time to time even got swept into conflicts with global dimensions far beyond their imaginations. Such were the First and Second World Wars of the twentieth century, and before them pre-colonial large canvas dramas of various kinds. Events of this nature capture our attention almost totally because of their telescopic dimensions. At the same time as he draws our attention to a wide canvas, Sithole is also able to narrow the canvas, zeroing in on the detail of experience to let us have a look, with something close to graphic insight, into the intimate, microscopic personal dilemmas of individuals within their families, their interactions with neighbours, the natural world, and institutions around them such as schools, churches, clinics, and stores. I contemplate today, a story that is a minute detail against the scale of its replicability across the vast South African landscape affecting millions of people over time. It is a story in which social intimacies between people sharing a local, close geographic space, are simultaneously shattered by habitual actions deployed to keep one another at bay despite the necessity for close interaction. Such distancing behavior has long become the social logic that drives how power and powerlessness among them interact continuously, to the benefit of one over the detriment of the other. Over time, mistrust and mutual suspicions define their interactions, prescribing what is possible or not possible. I contemplate a relationship between a world-renowned school in the Midlands of Natal, on the one hand, and on the other unknown citizens, denizens of a certain kind, who have subsisted in the shadows of the “greatness” in their vicinity. This story came into my life one day through the Internet. One moment there was no story to speak of; the next, there was. I sensed a profound kind of democracy in this unexpected encounter. It sets aside any suspicions of willful intent, laden with suspicious motives. It enabled me to contemplate the story with curiosity and the urge to go on a journey wherever it would take me. To enter the website of Hilton College, Private School for Boys, in the Midlands of KwaZulu-Natal is to experience something close to an epiphany. You encounter the very sense and essence of education embodied in institution. Three website screens let you into what this school is all about. This school, you read, is “Deeply Traditional, Refreshingly Contemporary”; this school has a “A Plan for Each Hilton Boy”; and this school is “ A World Class Campus”. The pristine whiteness of its buildings across the estate is accentuated by the lush surroundings of green manicured lawns, fields and heavily leaved trees. It is beautiful! But Hilton College has a secret life. That life, never heralded as part of greatness, has subsisted in the shadows in which the four men we have already met, and their invisible families, have lived for some eight decades of their lives. On the 24th of January 2017, Mndeni Sikhakhane turned 87. On 21 March 2017, Human Rights Day, Bhekindlela Mwelase turned 86 years old. Of the four men, these two are still alive. But catastrophe looms before them as the countdown in their lives ticks by, and the horizon gets closer and closer. Their deaths, it seems, according to Sithole’s account might just solve a niggling land issue for Hilton College; while their staying alive may prolong the burden of its complications. Here is a summary of events relevant to this reflection. As a consequence of the British conquest of KwaZulu-Natal, and the forcible dispossession of conquered peoples, the descendants of our four men and their families, and many other families in their communal locality, lost to Hilton Farm and ultimately to Hilton College, the land on which they had lived. That was early in the 1800s. In the series of military and political developments and in the unfolding administration of conquest since the beginning of the nineteenth century, we have learned from such scholars as Colin Bundy among others, about the dispossession, displacement, dislocation and dispersal of people forced by the British conqueror to become wage laborers in towns and cities, sharecroppers, or labour tenants on white farms, often on the very land that was taken away from them. Even the declarations of Nelson Mandela in a speech he delivered at Hilton in 1996 “that his government would ensure that the rights of labour tenants would be recognised and they would be given ownership of the land they had occupied for generations” did not prevent what eventually happened. In the face of Mandela’s assurances, elsewhere in South Africa many farmers evicted from their farms, labourers who had lived there long enough to be at home. But Hilton did not do anything as crass. The nature of agreements and incentives between Hilton College and families that ‘encouraged’ many families on college estate to decide finally, and against their long held interests, to relocate to Howick, a nearby town, is a story still to be told. But the closure of Hilton Intermediate School whose purpose had been “to educate the children of the workers based on the estate” will not have made things easy for the four families that decided to remain on the estate. To secure their rights, they took the opportunity to submit their land claims in terms of the Labour Tenants Act of 1996. That was the year of the new South African Constitution was adopted. This adoption occurred eighty-three years after the Natives Land Act of 19 June 1913 after which hundreds of thousands of Africans were dispossessed of their land by the Union Government. Overnight, the dispossessed became, as Sol Plaatje was to write, “pariahs in the land of their birth”. But the travails of our men and their families were not about to end. Their land claim applications were among 19000 claims submitted in 2001. As of now, sixteen years later, the Land Claims Court has not only not deliberated on the claims, but the relevant department of Rural Development and Land Reform, according to Sithole, “has actually lost or misplaced most of the 19 000 claims that were submitted on time. They quite simply do not know what happened to the documents. And for those documents, which are still around, they seem to be unable to remember what the documents are all about. The big issue is not that the Department has lost the Hilton case, but rather the reality that the Department does not intend on processing the claim. From 2001 to 2013, the Hilton families wrote repeatedly to the Department to ask it to send its claim to the Land Claims Court.” What a morbid delay it could turn out to be! Hilton College might just be able to settle a legal issue by default through the deaths of claimants to the land it occupies. But let us have hope. Two days after this lecture on the 31st March 2017, following an instruction from the Land Claims Court, the Minister of Rural Development and Land Reform is expected to appoint a Special Master to facilitate the labour tenants claims process. We wait to see what the Minister and his ANC government will do. Will they come to the aid of the dispossessed, or will they allow the logic of colonial dispossession to continue to run its course twenty-three years into a new constitutional democracy? We wait to see how two hundred and seventeen (217) years of history in the locality of an estate in the Midlands of KwaZulu-Natal will finally play out. For now, find a spot in your mind, to park this story for a while, and consider the moment when South Africans, all of them equally enfranchised, adopted the Constitution in 1996. It was a heady moment. The consultation process that led to its adoption was historic in its vast, encompassing reach. The process had been designed to be as good as the outcomes intended. The broad national consensus behind the adoption of the constitution was an indication that South Africans strongly desired to have something like a constitution: something close to a solemn commitment that signaled the beginning of a new phase in their history. On April 6th 2017, five days after the Minister of Rural Development and Land Reform will have decided on the matter of the Special Master and the pending land claims, it will be three hundred and forty-four (344) years that Jan van Riebeeck landed at the Cape of Good Hope, to begin a phase of history that our Constitution in 1966 was intended to formally bring to an end. Of-course, the formal end of the colonial epoch did not represent its material end. The economic manifestations of that epoch and the political and institutional cultures created to support them continue to exert considerable impact on the present. Their resilient impact understandably continues to be the site of contesting scenarios of how the historical wrongs of the past would be corrected against a constitutionally envisioned future. How successful would South Africans be in negotiating with past that cannot be changed for future that they can create? It was against such questions that the Constitution set a framework for new relationships among South African citizens. These would hopefully be based on an agreed set of fundamental values and principles from which to derive rights, privileges, benefits, duties and responsibilities of shared citizenship. That much was clear. But South Africans faced a question they needed to ask and time, resolve, and patience in which to answer it. How would South Africans begin to live together as people on the basis of a new solemn document, no matter how aspirational and inspiring it was, when for over one hundred and fifty years they had known one another largely across crude, binary simplifications of master and servant; taskmaster and labourer; ruler and ruled; “manager” and “managed”; “civilized” and “uncivilized”; “teacher” and “pupil”; “educated” and “ignorant”; rural and urban, “white” and “black”? Managing these simplifications were equally crude political, economic, and social rules that were fundamentally controlling and manipulative in their transactional character such that the direction of power, influence, and benefit was overwhelmingly predetermined in one direction: from powerful “whites” in control, to powerless “blacks” under control. Against such a background, to come into contact with one another, to experience one another as equals, and to encounter one another as a people without pre-determined, labeled identities, in a new constitutional democracy, and to become socially, politically, economically, and culturally welded into a new national community was, while desirable, a condition that could South Africans could not simply declare into being, even if that declaration was made in a constitution. To achieve the necessary bonding needed a great deal of work over time and the enabling political, economic, and social space in which to do it. Yet another question then needed to be asked. Was the necessity for that kind of work fully understood? Was it sufficiently, solemnly, and rigorously identified, its constituent tasks described, contemplated, and the capacity and capabilities for taking them on assessed and aligned into place? Indeed, how would work of such magnitude be undertaken, and with what means? And over what period of time would it be anticipated, it would yield its results in ways replicable far into the distant future? There was another, perhaps even more urgent, and arguably most critical question. On which segment of the broad South African population would the burden of agency and initiative fall to bring into being a new society? Which segment of the population would ask the formative questions about the work to be done? The answer seemed intuitively self-evident. It had to be the newly enfranchised, previously oppressed “black” people of South Africa. They would have to be the source of leadership and initiative to create the future. But how much did they actually see themselves that way? How conscious were they of the new role they had to play? What boundaries between them in their diversity and common history of dispossession and oppression, needed to be crossed for them to arrive at a consensus on collective agency for a co-created future? The Brazilian educator, Paulo Freire in his seminal book, Pedagogy of the Oppressed offers a deep philosophical understanding of the power of new freedom that has been struggled for to transfer historic initiative to free, newly enfranchised citizens. In the newly achieved society agency and initiative formally shifted from the erstwhile oppressor to the masses of newly enfranchised citizens. The implications of this shift according to Freire is that those who have embarked on a cause of self-liberation, no matter how long it may have taken across generations of struggling people, ultimately do more than free only themselves: they also offer the gift of freedom to those who had oppressed them. Such a statement will come across as counterintuitive. Are the newly enfranchised, previously oppressed, not expected and even inclined to be vengeful? Well, it did not happen quite that way in South Africa. South Africans worked out a negotiated settlement that brought about freedom for everyone with relatively little bloodshed. That kind of settlement was unusual in the annals of world history. It is for this reason that the South African transition from oppression to democracy attracted so much global attention. It was seen as a source of hope for the resolution of deep historic conflicts among peoples of the world. But negotiated settlements of this nature no matter how difficult it may have been to get to them seem easier in retrospect than the work of creating a new future for all those who agreed to the settlement. It did not take long to sense, particularly by the newly enfranchised citizens, that the true significance of the negotiated settlement may have been more formal than substantive. Certainly, a great deal of the Nelson Mandela and Thabo Mbeki presidencies, responding to the challenge of the constitution, produced an abundance of progressive policies and legislation, setting the stage for long-term far-reaching change. A central challenge of the new constitution to all South Africans, as we have seen, is in how it invites all citizens to humanize in all its conflicted facets, the national environment bequeathed by freedom. Not anymore unearned wealth and privileges; not anymore wealth of geometric proportions so vast its owners are unable to imagine it; not anymore inequalities in opportunity across the spectrum of national life; not anymore the dormitory townships that continue to export their energies to towns and cities to their detriment and perpetual dependence; not anymore the predictive power of the past to determine people’s chances in life in the present and future! President Nelson Mandela’s approach to social cohesion through reconciliation and its formal pursuit by means of the Truth and Reconciliation Commission was an attempt to establish a more human connection between former oppressors and newly freed citizens and to resolve historical complications through that connection. The name of the act of parliament to make this project possible tells the story. The overall purpose of the Promotion of National Unity and Reconciliation Act, No. 34 of 1995 was to pursue restorative justice through an approach to personalize human rights abuses and crimes committed “by having the victims and the offenders mediate a restitution agreement to the satisfaction of each, as well as involving the community. This contrasts to more punitive approaches where the main aim is retributive justice or to satisfy abstract legal principles” . We now know that the immediate intent of the legislation did not quite stack up against the long history of colonial occupation and the massive proletarianisation of conquered African nationalities, which predates March 1, 1960 by far. The current “decolonalisation” call in the wake of the recent #RhodesMustFall and #FeesMustFall Movements across South African campuses speaks to a recognition that the causes that led to the current complexities in achieving more effective, functional cohesion amidst the vast diversity of the South African population are long and resilient. It all suggests that the formal, constitutional reality of being a new nation has not measured up to the idea of actually becoming one. The voice of the newly enfranchised citizens, and by extension, the voice of the township, beyond political and trade union activism that were its language, began to exert a presence with an existential autonomy many aspects of which were beyond the reach of white people. The township, up to then no more that a labour dormitory, could transform into a self-sustaining space of private and public freedoms by a people with a strong capacity for self-definition as a foundation for a new and inclusive society. But how conscious of itself as agency was that kind of township space? I suspect that the history of proletarian dependence on oppressive rule, much as it may have been emotionally detested by the oppressed, may have became over time an indispensable feature of surviving in a hostile white world; so formidable that it could make it difficult for those in its grip to recognise such dependence, in its structures and emotional forms, as a barrier in their capacity to take the fullest advantage of the opportunities of freedom after its formal achievement. A failure to recognise the extent to which self-restrictive behavior could inhibit and limit significantly the imaginative and expressive possibilities of agency, might prolong the onset of that necessary and liberating sense of self-sufficiency. It is in the context of this kind of limitation that we can see a fundamental disconnect between the humanistic, democratic aspirations embodied in the South African constitution on the one hand, and on the other, the historic foundations of the South African economy on invasive and extractive, initially mercantile, and then industrial capitalism, whose extractive habits for natural resources and human labour, are still fundamentally orientated towards Europe to this day. To what extent did the new Mandela government and subsequent ones, despite their best intentions, function in an agency relationship with western economies? In such a situation, the democratic aspiration becomes harder to visualize against the reality of extractive orientations whose structural pillars remain firm but with only one historic difference: they are now additionally served by new numerically small, recruits who may labour under the illusions of self-empowerment as they in fact consolidate the dependance of the South African economy on foreign, colonially embedded needs. The new black elites in this context are a severely limited counterbalancing source of the new. If they are caught in a phase of survival dependence on an inherited economy with its deep imperfections, they have a responsibility to at least understand conceptually the bind in which they find themselves. Then they can begin to find pathways away from the bind. There is yet another aspect to the bind to contend with. It has been a major limitation of the “black” collective imagination in the last twenty-three years of democracy in South Africa to continue to ascribe to race primacy of explanation to understanding the South African predicament. Against the very specific realities of colonial history, race is by no means dispensable as a part of explanation, but it aught never to have occupied a status close to being a necessary and sufficient explanation. Far more necessary was the story of humankind in this part of the world where as South Africans we find ourselves. The designation “black” which inspired the Black Consciousness Movement was a moment in South African history beyond which under historically different circumstances could become a blind spot. It is often forgotten today in South Africa that two major threads, anti-racism and anti-tribalism run through a century of struggle for freedom in South Africa. This is because “anti-racism” has disproportionally dominated public consciousness. Understandably, race is inseparable from global colonial history. Over time, it has displaced other possible understandings of the South African human environment. “Tribe”, as the other category of social analysis, has been subsumed under race as a human attribute more attached to the conquered and than to the European conqueror. Thus, “tribe” served to contain the conquered other into a “black” universal category that was then perceived to be divided within itself into “tribes” locked in perpetual conflict. In that space, “tribe” partook of a timeless primitivism that explained “blacks” away, leaving “race” the dominant explanation of human relations and which enjoyed official propagation by the colonial, and later apartheid state. It is for this reason that a multi-tribal, multi-lingual, and multi-national gathering took place in Bloemfontein on January 8, 1912 under the banner of its name, the South African Native National Convention (SANNC). Its declared aim was “to bring all Africans together as one people, to defend their rights and freedoms.” The SANNC was the precursor to the African National Congress (ANC). a)	Human dignity, the achievement of equality and the advancement of human rights and freedoms. c)	Supremacy of the constitution and the rule of law. d)	Universal adult suffrage, a national common voters roll, regular elections and a multi-party system of democratic government, to ensure accountability, responsiveness and openness. The next four headings of this chapter refer to the “Supremacy of the Constitution, Citizenship, National Anthem, National Flag, and Languages”. All six of these provisions are as it were, constitutive of the state as geography, law, people, and systems of communication through the common symbols of song, visual identification, and language. In combination, these provisions seem designed to evoke and bestow a collective typifying effect on a national state of being, conferring on it identity, purpose, integrity, and coherence. It is section 1(b) of the Constitution that particularly attracts my attention in this reflection. I have always wondered why this section omitted the value of “non-ethnicism” or “non-tribalism”. This value, I continue to believe, should have taken its place next to “non-racialism” and “non-sexism” as a foundation value. Why did it not? I hazard a guess that when the negotiating parties that made up the Convention for a Democratic South African (CODESA) convened in Johannesburg in December 1991 the “black” or “African” component of that gathering suffered a memory lapse of historic proportions. They forgot to recall the significance of the 8 January 1912 convention in Bloemfontein that took a position that the conquered and oppressed peoples of South Africa ought to unite across the boundaries, among others, of “tribe” or ethnicity. That commitment has been largely observed, organically or with organized purpose, adopted and honoured in social practice and institutional practice, particularly in township settings, as South Africans and Southern Africans were pulled massively into in the evolving and ever expanding industrial, mining, commercial, agricultural, and cultural complex that emerged out of the growth of South African capitalism. This evolution has been occurring for some one hundred and fifty years. It seems reasonable to speculate that CODESA found it easier to prioritize “race” and the coming together of “races” as the most self-evident fulcrum around which to construct a legitimacy of common purpose. Wasn’t it that progressive, or “verligte” Afrikaners had risked apartheid state umbrage and travelled out of South Africa to make contact with the ANC? English South Africans could claim that their own “verligtes” have been working across race some decades. Equally so countless numbers of “blacks” or “Africans” would have hoped that the “coming together of races” would spread the benefits of modernity the entire social realm. Against this compelling imperative of race everyone seems to have forgotten that cross ethnic barriers among the “black” oppressed had become so porous they had significantly begun to blur through ubiquitous travel, work-place interaction, massive intermarriage, multilingual exchanges through social proximity and intercultural mingling in township settings had evolved to the status of a social norm. In this way, a historic opportunity was missed for the new South African Constitution to recognise and honour in its founding provisions, the most essential glue, and the greatest achievement and contribution of the oppressed, to the future of a cohesive human environment in South Africa. Indeed, there have since 1994 been no significant fault lines to speak off along tribal lines in the general population, and that fault lines of such magnitude seem highly unlikely to occur anytime soon. Significantly, the last time “tribalism” was mobilized, ostensibly by the dying apartheid state, was to destabilize intensifying “black” resistance to apartheid in the early1990s. That was when the apartheid government mobilised predominantly isiZulu-speaking dwellers of worker hostels in Soweto to attack multi-cultural, multi-lingual, and multi-ethnic neighbouring residents in what the government propaganda machine would call “black-on-black violence”. This would be indicative of inter-tribal hostilities of colonial anthropology against which this kind of violence could be understood to be an essential characteristic of “tribal” societies. But the mobilization of the IFP was fundamentally political rather than tribal. IsiZulu-speaking hostel dwellers in Soweto did not attack township residents simply because they were non-Zulu; the were mobilized on behalf of the political objectives of the dying apartheid state stave off the gathering storms of “black” resistance to apartheid which necessitated the declaration of states of emergency. This kind of “tribal” mobilisation of the 1990s never got anywhere near the levels it sometimes did among miners in the Witwatersrand mining belt in the 1950s and 1960s. The story of multi-ethnic blending in South African urban space led to another achievement of social movements across the Southern African sub-continent. It included a township cosmopolitanism that grew over the decades to include Zimbabweans, Zambians, Malawians, Mozambicans, and significant numbers of Basotho, Swazis, and Batswana. The latter three have been a cluster of nationalities so much a permanent feature of population landscape in South Africa that they are effectively not experienced by the broad multi-ethnic society as socially and politically apart, distant or even foreign. In this regard the Southern African Development Community (SADC) with a population of about 300 million Africans becomes an extension of regional cosmopolitanism that cuts across national boundaries. The diversity and cosmopolitanism of the South African population landscape has taken on a regional, multinational character. Mandela’s government of 1994, it must now be said, was the very first one in one hundred and fifty years to formally put at the centre of national concern the conquered, dispossessed, dispersed, decultured, and oppressed. The constitution was the symbol of that re-centering, and convergence of effort. The extent of the challenge was vast. None of the conquered African nationalities had before ever lived together voluntarily under a single constitutional dispensation. But the cosmopolitan and multi-tribal convergence speaks to an even larger matter of historic significance. The multi-national, multi-cultural, non-sexist, non-tribal, cosmopolitan community of Southern Africa, its axis strongly located in South Africa, does not need “whiteness”, “white racism”, “white men” and “white women” (however that baggage human colour coding from Europe has been spread around the world) as a reference point to define its identity and sense of self-worth. It has been in this part of the world for more than a million years. Against that time frame, the nightmare of 150 years of European conquest and colonial repressive rule is but a drop in the ocean. The human community that has evolved over that 150 year does have an enduring sense of itself as an affirming human environment possessing a real capacity to create a civilization once more in this part of the world, that derives its historical sense of self from Zimbabwe, Mapungubwe, and others beyond such as in Congo, Mali, Nigeria, Ghana, Ethiopia, and Kenya, Uganda, Tanzania, and Zambia among many others with crosscutting cultures that define collectively a distinctive space of culture: one more gift to the world. “Whiteness” as ideology or life-style in an overwhelmingly “black” demographic environment in Africa in the twenty-first century will be impossible to sustain. From the perspective of “whiteness” the township will be discovered to no longer be the source of labour and profit, but a site for the co-creation of new living environments that have evolved a new awareness for who they have become over the decades. Indeed, if multi-ethnic convergence has been a foundational factor of social cohesion in the last one hundred and fifty years of South African history then South African whites, a “tribal” entity that paradoxically became a “white tribe” even as it named others “black tribes” and then went on to distinguish itself as a “white” race above “black” races, are now late comers to a historic convergence that is increasingly maturing as a coherent social and national environment. “White” South Africans must now find their place within this new world and take on new identities. Will they recognise this gift that they have been invited to accept from those they once oppressed? The gift of the oppressed to their erstwhile oppressors will not be the expectation of their gratitude that at the time of freedom they inherited schools, factories, shopping malls, clinics, universities, research institutes, roads, highways, dams, and other “achievements” of colonial and apartheid history. In reality all these “achievements” resulted from organized and often enforced efforts of all South Africans who participated in their making despite the profound injustice in relations of power among them, and in the distribution of the rewards of collective effort. That British and Afrikaner interests presided variously over the colonial project that drove South African history in the last one hundred and fifty years does not confer on either of them a special recognition beyond the obvious reality of the colonial agency that was once in their hands and much of whose effects endure with a mixture of a great deal that has to be retained for the long term benefit of a new society, and great deal of what has to be thrown away for the same reasons. What distinguishes one society from another is not so only the extraordinary inventions that have enabled human effort, but also whether the human context in which they were achieved and applied is worthy of the combination of intellectual, moral, ethical, cultural, respect of universal humankind. It is from this perspective that the true gift of the oppressed to their erstwhile oppressors becomes an invitation to them to become a part of the humanization of the South African social and natural environment in its entirety. So, perhaps Hilton College carries a challenge much bigger and deeper than they may be aware of. It may be about land, but goes far beyond it. It is about meaningful living among a people who are finding themselves anew, away from binary simplifications that have led them to a dead end. It is about how to understand tradition in the face of the urgencies of the contemporary, that that understanding includes discovering in the formal sphere of learning, bringing new knowledge that will centrally be about a new world largely foreign to Hilton College yet has been in its back yard for close to a century. The families of Mr. Sikhakhane and Mr. Mwelase are the last for prospect for a much deeper link for Hilton College between tradition and contemporariness. Hilton College will have to decide whether to wait for the Minister to make his decision in the next day or two, on March 31 (and honour a dreadful history); or write on its website: “Mr. Mndeni Sikhakhane and Mr. Bhekindlela Mwelase, and those that have passed on, are the fathers, mothers, grandmothers, grandfathers, aunts, uncles, brothers, sisters and cousins of of all our boys. The College has taken a decision that the remaining families will continue to live and then rest on their land as future generations of boys tell the full story of Hilton College to themselves and the world. A college monument will be built in close consultation with all who have had to leave their land to commemorate tradition and contemporariness in the fullness of the story of Hilton College from the past into the future.” This will be the source of Hilton College’s new pride. The locus of energy to fuel the future of South Africa has shifted from the towns and cities of its colonial origins to the townships, a twentieth century phenomenon of labour reservoirs. That energy will continue to flow to the towns and cities, bringing with them from the townships new and different human orientations. Something new will be born there. But if the township is now this new source of energy, township communities, where more than sixty percent of South African citizens live will need to evolve a new and confident sense of self as the new human norm in South Africa. If the South African town and city were the sites of colonial energy, the townships are the current sites of the New Democratic energy. How that reality will evolve is the greatest, historic challenge of our times. Township energy has yet to activate itself to achieve its best. Until that happens, newly enfranchised “black” elites will be wont to extract wealth by emulation without a township orientated spatial and business grounding to invest in. Indeed, raiding the Public Treasury appears to be an determined objective of the Jacob Zuma presidency. Not much will come out of the wealth stolen that will uplift the quality of life among the vast South African poor. That is why 19000 land claims can lie somewhere in the dark and get lost while the misery of land claimants is overshadowed by the dizzying speed of blue light convoys. As the Hilton College of my imagination grapples boldly with the past and the future, they may well remind the new “black” elites that in the same way that colonial Europeans unwittingly became a tribe that “tribed” others, the “black” elites will unwittingly achieve success by solidifying the crude binaries of colonial origins with the difference that they may be the new tribe that “tribes” others of their own, with poverty and indignity. Such an outcome would be fundamentally out of character with the humane, democratic, and cosmopolitan spirit that the oppressed people of South Africa, now fully enfranchised, have created to be the predominant social norm that cries out to be developed. And then again perhaps the Minister of Rural Development and Land Reform of the ANC government will surprise us and proclaim the futuristic idealism expressed in the Constitution. He may confirm his and his government’s allegiance to the Constitution “as the supreme law of the Republic”. He may own up to a blurring of vision in his department and in his government, and commit to restore dignity to our men and their families, ensuring that it is respected and protected as the very reason for government in a constitutional democracy. Then perhaps this current government and others to follow will remember that following Mandela’s government, we are in the third decade of a new nation and they have to build on a task that had never be done in this part of the world before 1994: to bring together so many different and people inspired to create the next of the world’s successful civilizations.